The Curiosity rover is having a “field day” exploring the rocks in a shallow depression that scientists call ‘Yellowknife Bay,’ which is chock-full of light toned rocks. One small rock or feature – the size of a pebble or large grain of sand, actually – has caught the attention of many as it looks like a little flower. Keep in mind that this pebble is about 2 millimeters in size (a US dime coin is 1.35mm thick) so that’s really teeny tiny. But through the power of zooming in to the high resolution images of the Mars Hand Lens Imager, or MAHLI, there have been people who are convinced this is some sort of flora on Mars, or perhaps a fossil. Initially, it was suggested that this could perhaps be a piece of plastic from the rover, similar to what was found earlier, but the MSL scientists quickly determined this was actually part of the rock. Today, deputy principal investigator of MAHLI, Aileen Yingst of the Planetary Science Institute, told reporters that the big rock of which the flower is a part, named ‘Gillespie Lake,’ is a relatively dust free, coarse grained sandstone, with several larger grains in the matrix, “which are interesting because of their color, luster and shape,” she said, and this unusually shaped grain is lighter in color – almost opaque — which indicates it could be made of something different than the rest of the rock. But what really matters is what the team is finding out about this region, as those rounded grains provide a clue to the history of this area. “They’ve been knocked around, they’ve been busted up,” said Yingst. “They’ve been rounded by some process. This suggests that flowing water helped form this rock. Yingst also stressed that this feature is not biological, “But it does indicate that you have a relatively diverse set of grains just in this one sample,” she said. So, water in the past but no flowers on Mars. 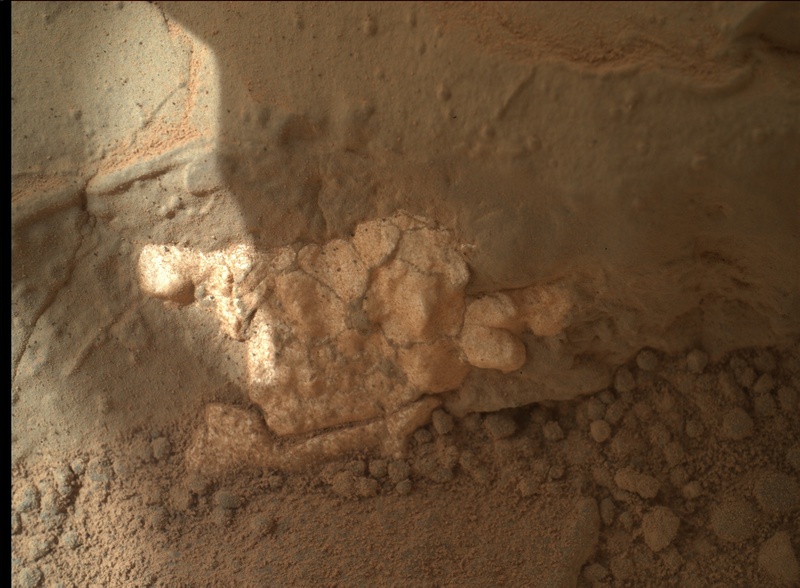 The rover has also found water-deposited mineral veins that fill fissures in the rocks, such as in the image below. The team will continue to study this area, and have chosen a rock on which to use the rover’s drill for the first time. Light-toned veins in the rocks in Yellowknife Bay. Credit: NASA/JPL/Malin Space Science Systems. See more images from today’s briefing here. I’ve seen raw opal similar in luster and shape as that. Find a diamond, and De Beers will have an operating mine there in five years. Might be a weathered Calcium or Silicate crystal? http://www.nasa.gov/mission_pages/msl/multimedia/pia16615.html The bottom image looks like a fossilized bone fragment? LOL! More like a truncated perchlorate vein? “I’m just trying to be clear that a light grain could be a lot of different things.”. Yeah…even a shell. Why not to investigate further ? Because there’s only so much you can do from 225 million miles away on a remote controlled rover that’s only built to drill, sample, and analyze soil and rocks. They’re being sincere when they say that this could be anything. …well…I’m not asking anything they aren’t able to do: simply to travel 19 mt and take a closer look analisys of that anomaly. Just this. Anomaly, shlanomaly! It’s a ligher bit of material. In any sandstone, there will be darker, larger, smaller and lighter bits of rock. Wishful thinking only makes it interesting, not evidence of anything else. Plenty of natural processes end up in crystals, smooth weathering, bright minerals, reflective surfaces, without indicating the slightest need for life. Also, flowers only evolved a couple 100 mya which, from what I’ve read, was not a wet period in Mars’ history, so it’s unlikely to be any complex plant life form. I don’t know when shells evolved, but it is very unlikely to be anything biological.